We’ve tested and compiled a list of the 5 best coffee scales you can invest in for 2019. There’s nothing worse than an incorrectly-measured brew of coffee, so save yourself the trouble and invest in one of these affordable options today. If you’re looking for a quick answer, our top pick is the Ozeri ZK14-S. If you wish to produce the best possible results when brewing coffee then you should know how important it is to properly measure the amount of coffee grounds to use. This guarantees you will get the best flavor and potency with every brew. Measuring the perfect amount might sound complicated but the good news is that you can use a simple kitchen scale to get it just right. In this article, we will be taking a look at the best kitchen scales for measuring coffee available to you in 2019. Features a variety of weight units. Various design choices for those worried about their kitchen’s aesthetics. Will sometimes take a bit of time to display an accurate measurement of weight. 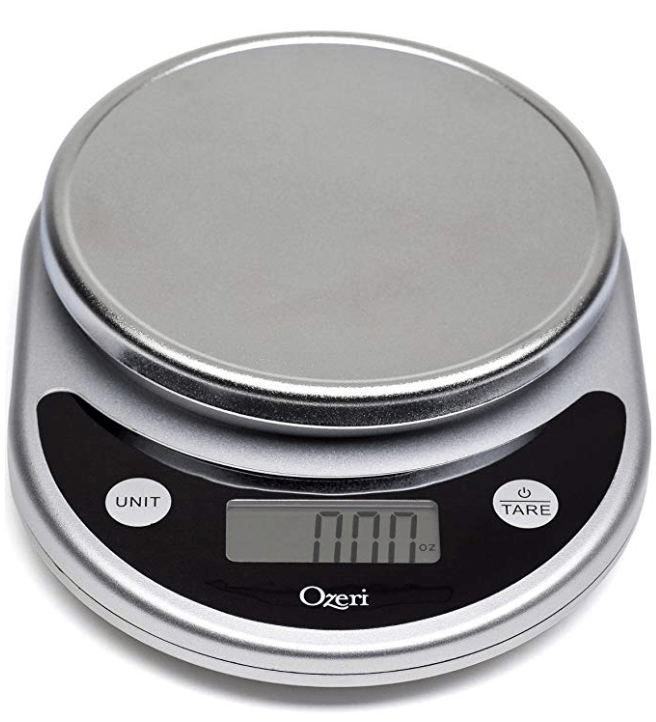 The Ozeri ZK14-S Food Scale is a highly accurate kitchen scale that can weigh items as light as .5 grams and up to 11 lbs. This digital food scale displays weight details clearly on its LCD screen. The display screen is also not obstructed by anything so you can clearly see the weight. 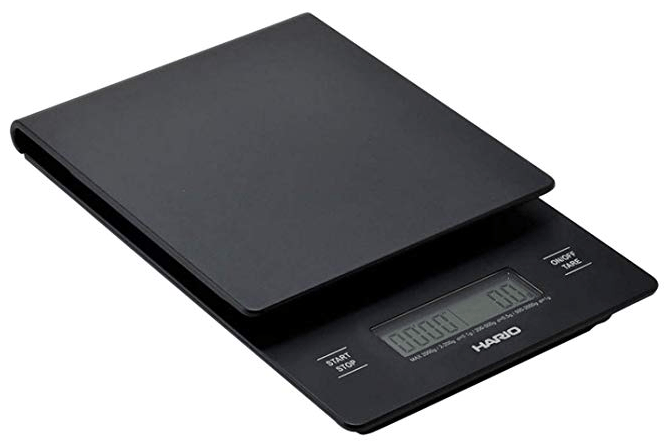 This food scale also has a tare feature that should allow for quicker weight conversions. It also has a battery saving auto shutdown function that turns the unit off after 2 minutes of inactivity. It automatically turns on when you put something on the weighing scale. It automatically shuts off in 2 and half minutes even if there is something on the weighing scale. Next up, we have something from AmazonBasics. 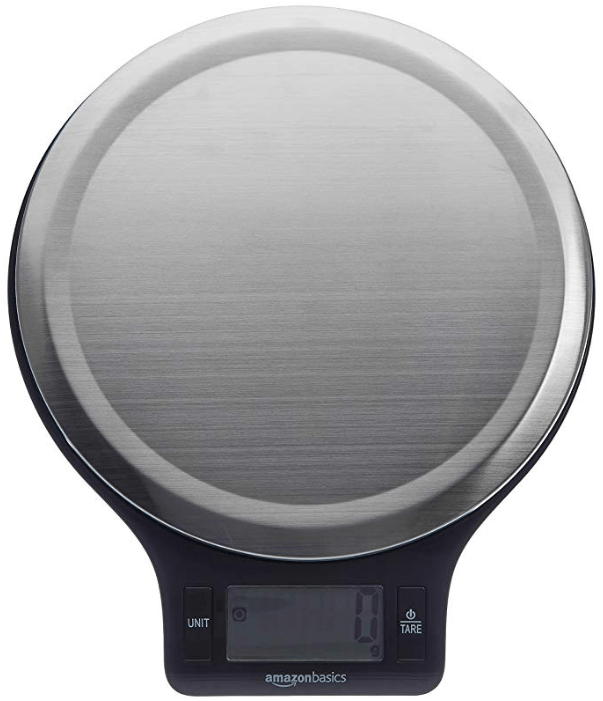 Their Stainless-Steel Digital Kitchen Scale is one of the most affordable in this list. The unit is well-made and is quite easy to operate. The controls use actual buttons instead of touch controls. The weighing platform is raised which makes it ideal for weighing larger food and ingredients. The unit is durable and should offer some water-resistant qualities, just don’t soak it in water on purpose. It uses AAA batteries and manages to provide accurate measurement almost effortlessly. Comes with a timer feature. Highly accurate and can measure weight between .1 grams to 6.6 lbs. Designed specifically for coffee ground measuring. Weighing scale needs to be perfectly still in order to get an accurate measurement. Ingredient needs to be centered on the scale. 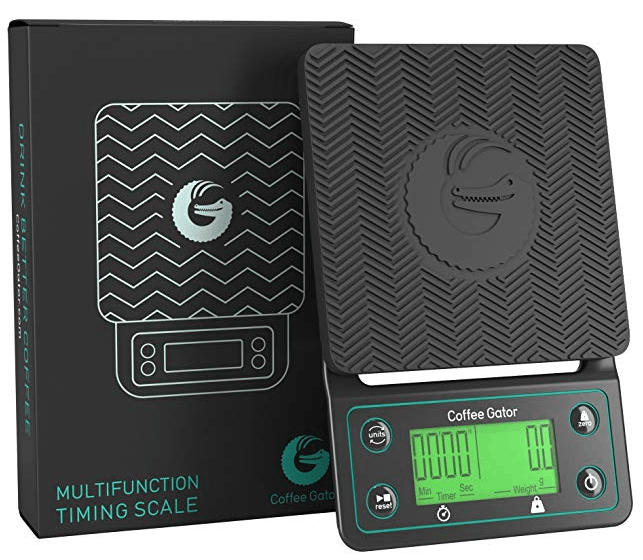 The Coffee Gator Digital Brewing Scale uses a pretty unique design which guarantees you will recognize their products from a mile away. This scale can measure in grams or ounces. It also has an accuracy of .1 grams which makes it an ideal choice for measuring coffee grounds for brewing. The weighing scale can measure up to 3 kilos as well. The Coffee Gator Scale can also measure using ounces and liters if you are looking to accurately measure liquid. The LCD screen is also quite bright and can display measurements even in a considerably bright environment. It also has a timer feature that you need to manually turn on compared to high end models that turns on automatically. Auto shutdown feature can be set between 5 minutes to an hour. Can only measure in grams. Hario V60 is a little more expensive but it earns every penny in its price tag. Accuracy is impressive at .1 grams. The LCD screen also displays both the measurement and the timer at the same time so no need to switch between the two during use. This weighing scale uses 2 AAA batteries which means you can take and use this anywhere with you. While it does have an auto shutdown feature, it is inactive when you have the timer on. A nice touch that will help prevent it from shutting down when still in use. Optional back light for the LCS screen. Large weighing platform is compatible with bowls of varying sizes. Ounce measurements are displayed in fractions. Another mid-range food scale that is part of the ‘elite’ club, the OXO Good Grips offers some nifty features to justify the higher price tag. This is a sleek and stainless-steel kitchen scale that is quite easy to clean. Design-wise, it has a unique feature that allows the digital display to be pulled out of the unit. This allows for less chance of getting the screen obstructed during use. For those who have some trouble seeing the digital display, the OXO offers users the ability to turn on a back light. It also comes with a tare feature, can measure in ounces or grams, and can support/measure weight of up to 11 lbs. When it comes to buying the best coffee scale for your needs, there are specific features that you need to look out for. Making sure the coffee scales have all of these (and more) will allow you to brew the perfectly-measured cup of coffee in a highly convenient fashion. Tare Function – This will help eliminate the need to bring out a calculator as the weighing scale will do the calculating for you. All scales should have this feature. Accuracy in Measurement – Coffee brewing is all about accuracy. The weighing scale should be accurate within .1 grams. Remember, you will be measuring smaller amounts most of the time, and every single tenth of a gram counts. Timer Feature – Again, this helps make things more streamlined and convenient. Auto Shutdown Feature – Almost every kitchen/coffee scale is powered by a battery. This feature will help increase battery life. Size of the Scale – Smaller means more portable and easier storage while larger ones are more versatile in the kitchen. Why Should You Use A Coffee Scale? Precise measurements deliver consistency when it comes to the flavor and strength of brewed coffee. Precision is key when brewing coffee and every gram of coffee ground is a huge factor. Ground coffee beans can be quite expensive. Using a coffee scale will help optimize the amount you use without wasting any of it. If you are using instant coffee powder then a scoop will do fine, obviously. However, using a scoop to measure how much coffee grounds you brew is criminal. Not only is it wasteful, you will have a highly inconsistent flavor for every cup you brew. If you are spending money on quality coffee beans or coffee grounds then you owe it to yourself to get a high-quality coffee scale. Using it will guarantee you get the most out of your coffee brews. Making the perfect brewed coffee requires the right equipment. The coffee scale is the first among these essential items you will need. Hopefully, this article has helped you determine the right coffee scale for your needs, or at the very least, pointed you in the right direction.